It’s almost here—Spring Market in Pittsburgh—May 16 to 18, and we will be there (Booth 418) to see old friends and meet new ones. 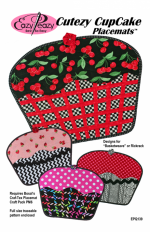 The Cutezy CupCake Placemat pattern is just the thing for your 2-hour in store classes and includes instructions for two designs. It makes use of Bosal’s Craf-Tex Placemat Craft Pack PM6 and a full size traceable pattern is included. a placemat patter n to fit everyone of the Bosal Craft Pack Pre-Cut Forms. 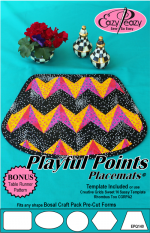 Playful Points Placemat took some thought on our part but now there’s a pattern for Bosal’s placemat oval, circle, trapezoid, rectangle AND hexagon plus we included a bonus pattern for the Playful Points Table Runner. built a fine shop with a catchy name and great reputation which should be protected at the national level. Eazy Peazy Gal suggests you consider applying for a registered trademark for your shop’s name. It’s doesn’t cost a lot but could save a lot of hassle from imitators down the road. We just received ours for both our name and logo. AND, speaking of down the road, we are looking forward to our time with you in Pittsburgh.